Nerve root pain, more commonly known as a ‘pinched nerve’ is a common injury that can happen to any of the nerves in the spine. Nerve root pain that originates in the neck is characterised by arm pain, pins and needles, numbness and sometimes weakness in the arm, hand and fingers. In more severe cases upperlimb reflexes can be affected. These symptoms are caused by either compression or irritation to one of the nerves in the neck causing the nerve to become inflamed. Neck pain is not always present when there is nerve root pain. 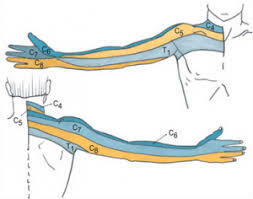 There are seven nerves of the neck from C2-C8 and each nerve has its on dermatome, which is the area of the skin that the nerve supplies. See the dermatome map above to see the area that each Cervical nerve supplies. There are several things that can irritate the nerve such as a disc bulge, stenosis (narrowing of the canal the nerve passes through), osteophytes (bone spurs), degeneration and inflammatory changes. Pain is aggravated by neck movements that reduce the size of the intervertebral foramen (there area where the nerve passes through). This includes any movement that increases pressure on the nerve root such as moving the head back and rotating or tilting the head to the side of the pain. Furthermore, pain and symptoms may decrease when the area the nerve passes through is opened such as bending the head down or tilting the head to the side away from the pain. Treatment consists mainly of techniques that help to open the area the nerve passes through to reduce the irritation. Sustained traction of the neck has been found to help along with low grade mobilisations. Additionally, your Physio may also use manual therapy and dry needling aimed at loosening up the muscles around the neck. Depending which nerve is affected there are specific nerve glide exercises that help to loosen up the nerve and reduce irritation and symptoms. Your GP may also prescribe you anti-inflammatories to help reduce the nerve pain if required. In most cases the symptoms of nerve root pain resolve with treatment. If you believe you are suffering from nerve root pain call 01-441-0100 to speak to a Physiotherapist.